What's happening today at Niagara University. What may have happened when two internationally known physicists, Niels Bohr and Werner Heisenberg, met in 1941 to discuss the creation and ultimate use of nuclear energy …? Was it for good or for mass destruction? In this award winning play by Michael Frayn, the playwright offers us intellectual discourse and debate about human intentions and moral obligations. 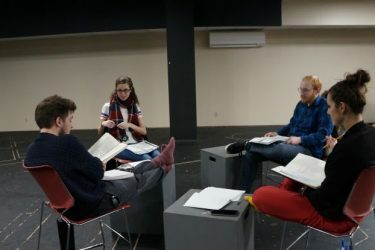 Directed by NU Theatre Alumna, Katie Mallinson, Copenhagen is being performed in an intimate production to inaugurate the new Acting Studio from February 21-24. Copenhagen will be on the NU Campus in the Acting Studio*, Clet Hall at 7:00 pm on Thurs. Feb. 21, and at 7:30pm on Friday, Feb. 22 and Sat. Feb 23. A 2:00 pm matinee will be held on Sat. Feb. 23 and Sun. Feb. 24 (with post-show discussion). Have something to add? Send your submission to us for inclusion in the next Daily Post.